Big Bang Bash at National Museum Scotland. Edinburgh International Science Festival 2016. Our next theme we are beginning to explore is Space. 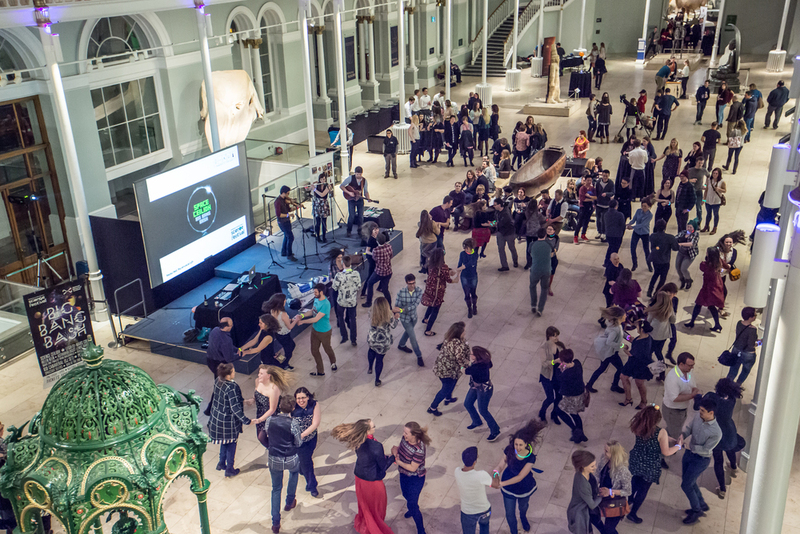 We kicked this off on April 1st with the Edinburgh International Science Festival's Big Bang Bash at the National Museum Scotland, followed by a family Space Ceilidh at Space Day. We have a few space dances written, and are working on developing even more in the future in collaboration with community groups and space scientists! We have some resources of the dances freely available below, and hoping to develop this further too so they have more information & curriculum links (see here). Better still, come see us at one of our Space Ceilidh gigs!! We have written Stardust, with Jindra Gensior, a student at the University of Edinburgh, all about how Stars are formed, and the Aurora Whirl below it. Our Aurora Whirl written with our very own Helen Le-Mer. Higher Resolution version downloadable here. Inspired?! If you have an idea for a space-themed dance or cosmic jig, you can enter here or below - if we like it, we might even be able to make a dance and name it after you!